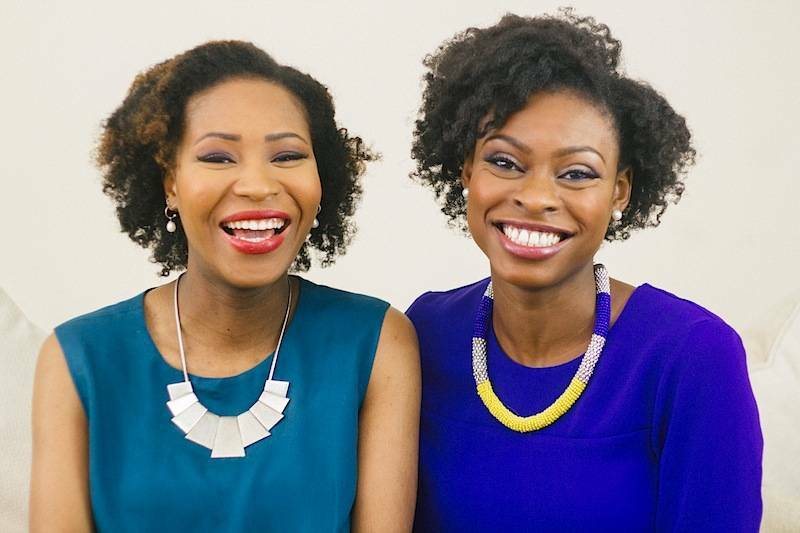 When Afrocks meet with Afrocenchix founders Rachael and Joycelyn, it’s always to ask cool questions. Sometimes. Anyway, we discuss Crowdfunding, beauty products and chicken wings…yes! Hello ladies, could you please tell us a bit about Afrocenchix, and how it all started? Rachael: Joycelyn used to relax my hair. Once day we were talking as she applied the relaxer, she told me about these products she was making. I’m allergic to everything so I got overexcited when she gave me an oil mix to try for my skin and I didn’t react. Joycelyn: there wasn’t a natural hair scene in the UK in 2008. I was focused on growing my damaged hair so I’d mixed some oils for myself but I told Rachael I didn’t come to university to start a business. Rachael: I’m stubborn when I think something should happen, so I persuaded Joycelyn we could do it if we worked on it together. We invested £50 each and bought ingredients, did loads of research and made two oil blends which we sold at a small community event in London. The business grew organically from there with us reinvesting in making more products in line with customer demand. We saw that so many people like us wanted natural products that actually worked for black hair. Now our customers keep us going! You started a crowdfunding campaign a few days ago on Indiegogo. Why did you choose that path to raise funds? We need to grow to meet our surging demand & release the new products our customers have been requesting for years but many investors tell us we’re “too early” or they just “don’t get” the problem. So after trying traditional business growth avenues, we’re crowdfunding to take the next small step in scaling up! Our goal is to ensure that safe, effective & affordable products become the norm in the Afro and curly hair industry. You can support us here! What are your top 3 tips for someone interested in making products? Research, research, research! Many ingredients have certain properties that are either enhanced or cancelled out depending on what they are mixed with so it’s important to do your book research first, record all your experiments when making products and test them out in different circumstances to make sure they serve the intended purpose. At Afrocks we are on a mission to get afro hairdressing recognised as a profession, and not a hobby. How do you feel about this? We think it’s important that hairdressers are properly trained and comply with professional standards. Rachael recently had an awful hairdressing experience and it reminded us of so many bad salon trips growing up. We can learn a great deal from the US where hairdressers have to attend cosmetology school and really understand the hair as well as chemicals such as dyes that they handle. We’re 100% behind the Afrocks mission! Ouch! Rachael, can you let us know a bit more about some of your worst experiences? Rachael: Haha yes! As earlier mentioned I recently had a hairdresser destroy my hair when I was testing them out for possible collaboration. Joycelyn can do hair herself so she’s been luckier, I can’t even cornrow so over the years I’ve had it all from being under the dryer for hours whilst the stylist pops out, to having to ask them to wash their hands after snacking on chicken wings then coming back to do my hair! Whaaaaat?? Eating chicken wings…Oh Lord. Ok onto the next one. Our Hair and Business Consultant Simone has that thing: She believes we should refer to the style as ‘Canerow’. What is your take? Canerow or cornrow? Cornrow! The braid resembles corn. Sugar cane looks nothing like a cornrow! At Afrocks we are also on a mission to empower women who choose to wear their hair Natural. You recently hosted an event to discuss what is black men’s perception of natural hair. Why did you think such an event was important? What did you learn from it and what was the outcome? The natural hair community can become a bit of an echo chamber so quite a few people were upset that we brought up this “dated” topic and even had the cheek to get men to speak. In reality it isn’t a dated topic, we frequently speak to women and men about afro hair not fitting into mainstream beauty ideals, about some textures being favoured above others and about men not finding women with natural hair attractive. Many women are put off going natural because they think men prefer straight hair. We’ve also had a men’s panel requested dozens of times over the last few years so we finally decided to cave in and ignore the controversy because we hoped it would be helpful. We’re glad we did, the event was uplifting, informative and a real eye opener. We heard the perspectives of a father and husband, the viewpoint of an uncle and a huge amount of natural hair appreciation. Can’t go wrong with old school Afrobeats tune! What is the funniest thing that has happened to you recently? Rachael: I have a toddler so every day is hilarious but sometimes only on reflection. She recently discovered my makeup bag and went as far as applying mascara near her eyes and lipstick all over her mouth, the walls, the bathroom cupboard… it was funny after a few hours and a reminder of just how much little ones pick up whether we realise it or not. Our last question: what 3 things couldn’t you live without? Hmm, avocados, Afrocenchix products and books! – Complete research and development and cosmetic testing for Swirl, our silicone-free conditioner. sorry for got to tell you the name of the my busines thats intrested in your empowering semina so excited to be following, this positive sight im babbling so here it is Gloriously Naturel WOULD BE INTRESTING IN STOCKING YOUR NATUREL PRODUCE, ALONG SIDE THE INTERVEIW FOR KEMET RADIO.